The earliest recorded school in Willunga, Buckland House was opened in 1847 by James Bassett. This private school developed a fine reputation and lasted to become the nucleus for the first public school in Willunga. Other early schools were more transient. The Dirnier School at Ingleburn Farm was opened by Henry Marshall Cox in 1848, with 22 children, but is not recorded beyond 1850. There is an early reference to Miss Beeck, who opened a school during the 1850s in a building provided by the Hill family, before returning to England. By 1852, the SA Government had passed an Education Act and began to license teachers, pay them a stipend and assess schools annually. Buckland House Academy received glowing reports. A school at Logan’s Flat opened in 1852 but was closed by 1860, due to unsatisfactory accommodation and mediocre instruction. Two schools opened in 1852, Augusta Shaw’s and Ellen Scrivener’s, but they had both closed by 1854. By 1853, the Buckland House enrolment had doubled and Bassett’s second wife, Mary, began to teach the girls, some of whom were boarders. In 1862, James opened a schoolroom next door, (now called The Bassett Boys' Schoolroom), where he taught the boys until his death in 1875. The Sisters of Saint Joseph in 1868 opened a Catholic school in the building which is now St Joseph's Catholic church hall. In 1874 Charlotte Smith opened a school next to the Willunga Show Hall with 45 female pupils. The building has been demolished. By 1875, the scene was changing; the new Education Act introduced education for children aged 7 to 13 and established state schools and, with Bassett’s death, the town found itself without a boys’ teacher or a schoolroom. Thomas Noyé was appointed and taught in the Primitive Methodist Chapel until the public school opened in 1877, remaining as Head Teacher until 1888. Charlotte Smith closed her school and became the Head Teacher at McLaren Vale. Mary Bassett continued to teach girls in her private school, Buckland House, until 1889. During the 1890s, St Stephen’s Church of England operated a private school, run by Ella Hawkins, in the Bassett Boys' Schoolroom. In 1883 the Catholic school closed, and its remaining students transferred to Willunga Public School. 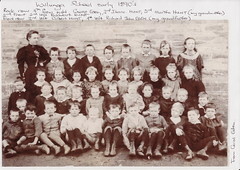 In 1947, Willunga Public School became a Higher Primary School, catering for pupils to Grade 11 until 1960, when the new Willunga High School opened. More recently, in 1989, the Willunga Waldorf school, which enrols students from Kindergarten to Year 12, was established. So, at present, Willunga supports three schools, continuing a provision of education that spans over 160 years. Articles in newspapers on Trove website . Miss Charlotte Smith's Private School, ca 1875. Do you remember Early Schools ? Then Join up and add your memory here.